In the movie “Thor: Ragnarok,” Odin tells his son Thor, “Asgard was not a place, it’s a people” -- meaning wherever the citizens go, so will the soul that makes up the society. This idea is similar to the concept behind Cisco’s “Data Center Anywhere” strategy of decoupling the data center from a single location -- the data center is no longer a place, you could say, it’s a set of management and security policies. In other words, the data center is wherever data and workloads go. Businesses used to store all data in their data centers, but the world has changed and now you can find information stored in branch offices, public and private clouds, in Internet of Things edge networks, and other places besides the enterprise data center. You can easily see this idea extended to communications; a private cloud UC implementation could include components scattered all over the globe -- call control in location A, video control in location B, and so on, with management policies tying them all together. Again, anywhere the business has data or workloads now needs to be considered part of the data center. That’s the concept behind the Data Center Anywhere strategy. This announcement extends Cisco’s software-defined network solution, Application Centric Infrastructure (ACI), to the Amazon Web Services and Microsoft Azure public clouds. This will help enterprises create a consistent set of management, security, and intent-based networking policies for application anywhere data and workloads reside. In essence, ACI Anywhere allows centralized management of fragmented data by treating the entire domain as a single entity. Without it, customers would need to make policy changes in each location, creating a management headache. With the extension of ACI into these clouds, a security professional would be able to configure a security policy in ACI for automated enforcement everywhere, for example. 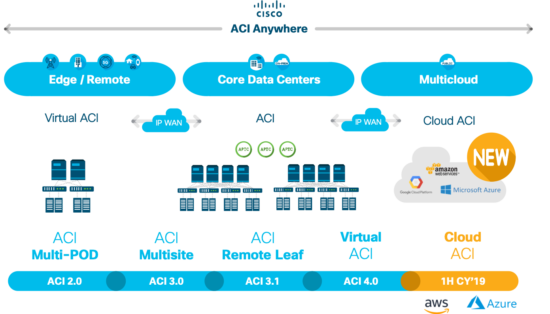 ACI Anywhere extends the ACI domain out to the multicloud environments. In addition, Cisco has significantly increased the scalability of its ACI Multi-Site Orchestrator, which enables policies to be pushed to multiple data centers across the globe with a single click. ACI Multi-Site Orchestrator will now support up to 12 sites (up from seven) and 1,200 leafs, or lower-tier switches, (up from 400). This extends management simplicity to the cloud and every location, for a reduction in operational expenses. This is a logical extension to ACI, which has evolved tremendously over the past several years. Since its launch, ACI has evolved from a single location product to multipod to multisite, then remote leaf, and finally virtual ACI. The ability to run it on public cloud infrastructure is a logic extension of the product. This extends Cisco’s hyperconverged infrastructure (HCI), HyperFlex, into remote and branch offices. HCI began as a niche technology for simplifying the deployment of virtual desktop infrastructure (VDI). Over the past several years, the number of use cases for VDI has exploded, with one of the more popular ones being analytics. By pushing HyperFlex into remote locations, a company can run analytics and other compute-intensive workloads closer to the data. Currently, deploying HCI to multiple sites can be complicated, requiring staging in a central location, sending the nodes out, and then doing a truck roll. Business-disrupting errors are often made in this process. With HyperFlex 4.0 (HyperFlex Anywhere), the nodes can be shipped to the edge sites with no pre-configuration. IT professionals can use Cisco’s IT operations management (ITOM) platform, Intersight, to automate the configuration of the HyperFlex edge nodes or clusters for true zero-touch installation. This enables businesses to be much more aggressive with their HCI rollouts. The third leg of the Data Center Anywhere stool is CloudCenter, featuring updates that help customers manage the lifecycle of applications across their multicloud environments. New to the CloudCenter management solution is a cost optimizer that provides reporting and visibility of workloads, network, storage, and other services across public and private cloud infrastructure. These optimization recommendations provide businesses with data they can use to slash cloud spend. Also, CloudCenter is now available as a software-as-a-service offering instead of just on premises. Today, data is everywhere, which means the data center is no longer a fixed location. It exists everywhere data is created, processed, analyzed, and used. Cisco’s new Data Center Anywhere solutions extend control and management to everywhere data and applications live.